1. 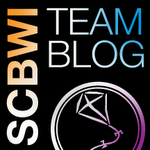 Being part of SCBWI Team Blog was fantastic! It's a lot of work, but fun and satisfying - especially as so many people came up to me to thank me for the conference blog and all the tweets! And working with Alice Pope , Martha Brockenbrough, Jolie Stekley, Jaime Temairik and Suzanne Young is a joy! Edward Nearsulmer IV saying "you don't want Hector on the cliff on page one, or on page fifty." But you do need to grab his attention. And Mary Kole saying "where to begin is the eternal question" in any story, and advising: "for the first moment, establish something and stick with it." I think a lot about how to start each story I work on, and I'm glad to add these craft gems to my toolkit! 3. Liz Szabla's words on a tight plot: removing one incident will make the whole story crumble (rather than just leaving a hole.) That's very wise! 4. Lois Lowry's point behind her great quote, "give sorrow words." give happiness words, give jealousy words, give anxiety words, give fear words - take those intense emotions you've experienced in your life, and give them words. "Everything in it was a lie, but it was a true story"
because it was based on emotions he's had! "Everyone's looking for the next sparking debut." I like that. It's full of hope, on both sides of the equation. "If you show you're angry in print, no one will get angry with you." (it's a turn off) "You have to do it seductively and subversively." I thought that was really profound. It kind of fits with my own theory that scenes are more emotional to read when the character doesn't let themselves cry. When they fight it. Look - I'm on the sign for the LGBTQ in SCBWI panel! 7. 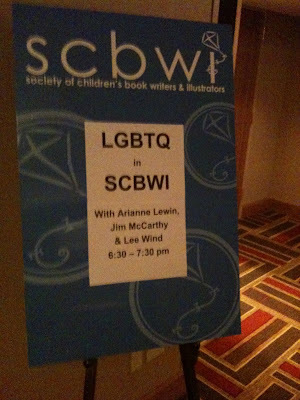 Moderating the LGBTQ in SCBWI Chat, from Aaron Hartzler's goose-bump inducing introduction to Ari Lewin and Jim McCarthy's sitting in a giant circle with myself and Aaron and more than 50 conference attendees to talk about and answer questions on including LGBTQ characters and themes in children's literature. And most of all the sense of TRIBE within our SCBWI TRIBE - and how so many attendees hung out and met each other afterwards! 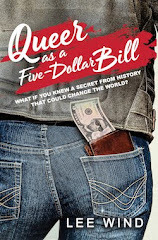 A number of people approached me afterwards to thank me and said that the discussion has emboldened them to finally include LGBTQ characters in their current work - and that's so wonderful! "Save the chaos and drama for your books." YES! I love this and believe in it! I would needlepoint it on a pillow if I did that sort of thing. Maybe I'll make it a T-shirt, with a slight shift in P.O.V. : "I'm saving the chaos and drama for my books." 9. Sara Zarr's keynote on living a creative life, and her urging us to "try to lead a mentored life" - a life where we are mentored and we mentor others. I'm amazed and honored at all the informal mentoring I'm fortunate enough to receive: writers and artists well established in their careers - members of SCBWI - reaching out to me, believing in me, advising me and cheering me on. And now, being part of the Nevada SCBWI Mentor Program and being officially mentored by the incredible editor Emma Dryden makes this one resonate even more powerfully for being mentored, and I endeavor to be a mentor to others, too - to kid lit writers and illustrators through my work with SCBWI and, of course, to GLBTQ Teens and their Allies through this blog, the books I'm writing, my speaker visits in schools and my volunteering weekly as an advisor at a local high school's GSA club! Being mentored and mentoring is a beautiful, profound and exciting way to live my creative and overall life. 10. The panel on humor and Lenore Look's insight about the power of humor being like the court jesters of old, enabling the King to look carefully at things that were hard to look at and think about those big, uncomfortable questions. "I stopped thinking about me and starting thinking about the work, and things started to flow." Voice: The best words in the best order to serve the story. 13. There was lots of talk about the current changes in the market for kid lit, and how some of the challenges may actually be opportunities, but this one idea I heard twice: Teens are experiencing digital fatigue, and need books to decompress from technology. (Ginger Clark and, well, I apologize that I don't remember the other brilliant speaker who said it, but it is a take on the current market that is really sticking with me. 15. All the conference attendees who came up to me and told me they've read this blog. And thanked me for doing it. That means so much to me. Thank you. 16: I feel turbo-charged! These SCBWI conferences are career-changers, and I always feel energized about the business, craft and inspiration of this calling to create children's literature. But most of all, I'm reminded that it's the sense of TRIBE, the feeling of belonging to a community, that I value the most. And I'm so grateful to be part of it. *If your name's not listed above, it doesn't mean I don't think you're fabulous. You are. And I cherished our connection. What a cool post! This makes me want to make my own "Top n Things About SCBWI Conference" list. I love that Edward Necarsulmer quote about "You don't want Heathcliff on the cliff on page 1." That really made me laugh. I think he is probably the coolest literary agent of all time. He has rejected three of my novels so far, with extremely kind and gentlemanly rejection letters, and for some reason he signs them "As ever." Just had to stop by and say thank you! Because now I feel like I was there. Those are all wonderful moments. Nora - do it! I'd love to see your highlights! Lisa, you're welcome. Hope you get to attend one of these SCBWI national conferences (NY or LA) and experience it for yourself - and then I'll enjoy reading YOUR top take-aways, too! You are a delight and a joy. Hope I will see you in LA in the summer. Appreciate all your hard work and we've done our best to share it here in KC. And YES, I'll be there, Team Blogging it at the #LA11SCBWI ! Sounds like an amazing time! One of these years I'll make it. Thanks for sharing your experiences, Lee. 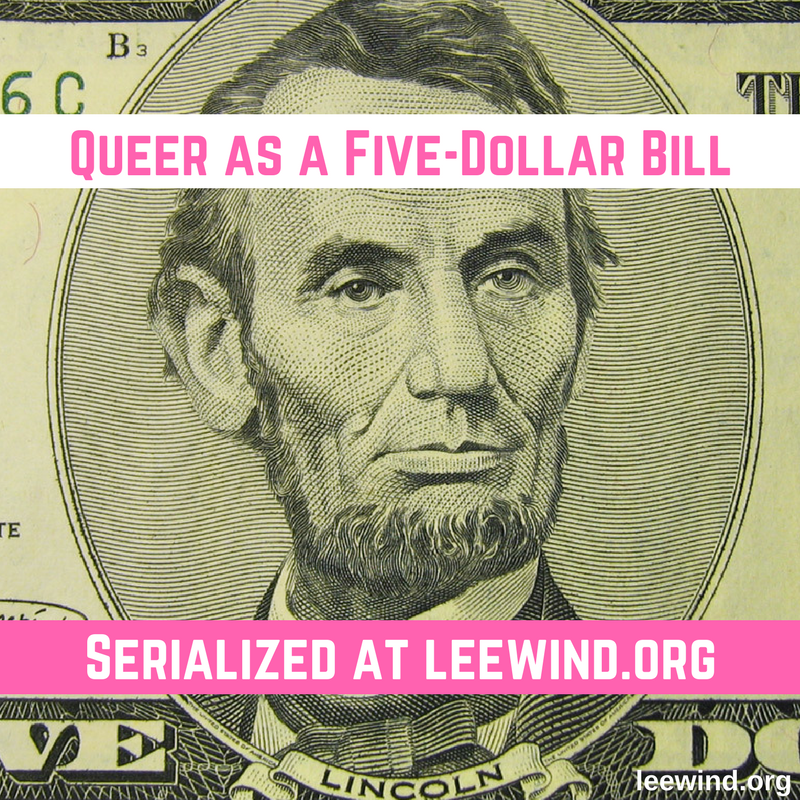 Great post and I loved the awesome LGBTQ event! It was a lot of fun reading your top 16 list! The quotes you picked out are the ones that really resonated with me, too - I wanted to hug so many of the speakers for saying something that I needed to hear (except, well, that would be creepy). The GLBT Q&A was awesome, thanks so much for that! I really came away feeling inspired to write something (but not an issue book! :)). It was a pleasure meeting you at the conference. I am Hazel's tall, good-looking friend. Okay, I got the tall part right. Thanks for sharing your thoughts and notes. I look forward to seeing at future conferences. Thanks for sharing, Lee!! The conference coverage by you and all of Team Blog is amazing! !